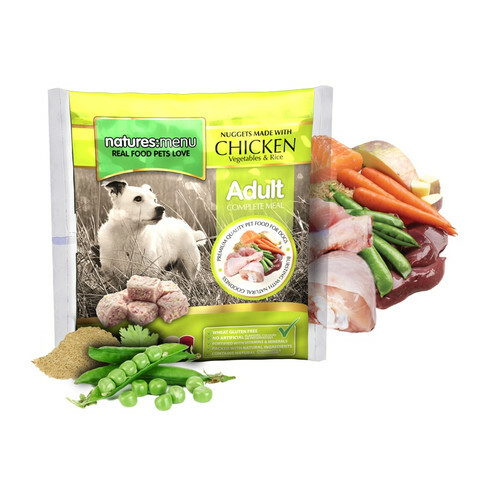 Scrumptious free range Chicken Complete and Balanced raw meal. Created in easy to serve ice cube sized frozen nuggets that can be simply counted out into the bowl and when defrosted, handed to your dog, Simple! We recommend also feeding some of our raw meaty bones and chews throughout the week for the health of your dogs mouth, teeth and natural behaviours. Chicken is a delicious light meat, a firm favourite for all dogs. An easily digestible protein that contains many B vitamins and useful amounts of Iron, Zinc, Phosphorus, Selenium and Potassium. Green Tea and Grape Seed Extracts provide your pet with added antioxidants to help minimise the damage free radicals can cause, and promote health. Protein (12%), Crude Oils & Fats (6%), Crude Ash (2%), Crude Fibres (1%), Moisture 70%.